Solving one of the longest cases of mistaken identity, University of Alberta PhD candidate Greg Funston recently described a new genus and species of toothless dinosaur from Alberta. 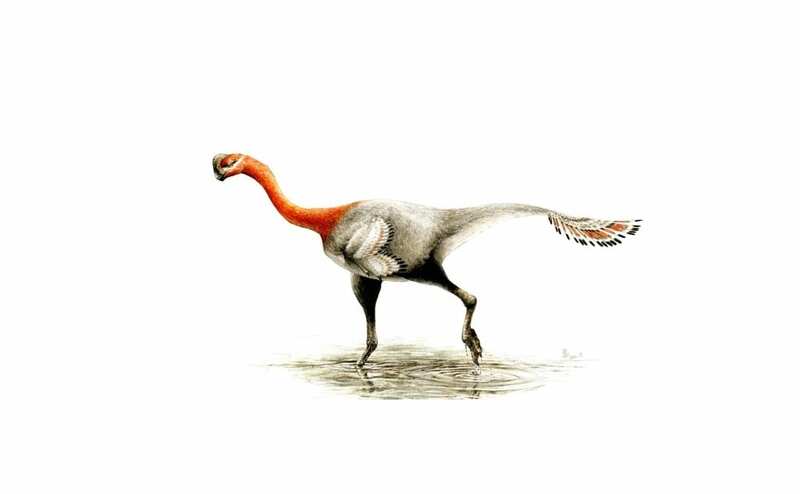 Long thought to be a more common ornithomimid, Apatoraptor pennatus instead turned out to be a member of the notoriously enigmatic caenagnathid family. The Apatoraptor pennatus fossil is the first articulated caenagnathid skeleton from anywhere in the world—meaning the bones are still in the same position as when the animal died—and is by far the most complete caenagnathid skeleton from Alberta. The discovery helps fill in some of the missing puzzle pieces on this elusive group of animals. With such a beautifully preserved fossil, the scientists were able to use CT scanning technology to fully examine the bones. They were surprised to find pits on an arm bone corresponding with feather scars. “These feather scars suggest that Apatoraptor had a wing of feathers on its arms, although it couldn’t have used these wings to fly,” says Funston. Instead, he explains, the wings were likely used for sexual display to attract mates. Funston worked on the findings with his supervisor, world-renowned paleontologist Philip Currie, professor at the University of Alberta and Canada Research Chair in Dinosaur Paleobiology. He worked with his fellow grad student, paleoartist Sydney Mohr, on the life reconstruction. Mohr used modern birds as inspiration for the colouring.